Playing the Federal Reserve meetings. 8 times à year, the US Federal Reserve (Central Bank, the FED) has its ‘regular‘ meetings to address the state of the US economy and its interest rates policy. In conjuction to a FED meeting, there are great price fluctuations in the financial markets as shown through the charts below. These variations are extra ordinary trading oppertunities intraday and shorter term. The cause of a certain price move is extremely difficult to foresee or know in advance. Market behaviour statistics may lead traders to 'a righter path' in order to find potential profits from certain trading patterns. This is when you should remember that market participants trade price to profit, and nothing else. Gold and the Nasdaq100 index, are good examples of how price movements evolve through the important fed-meetings. 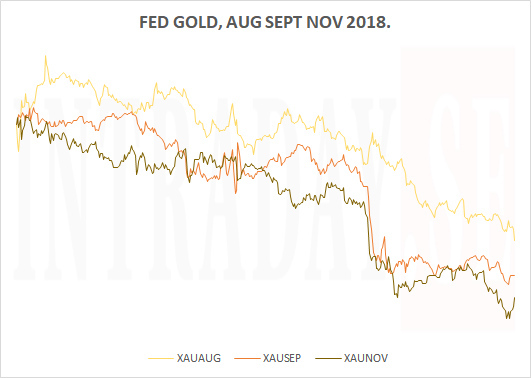 Below is Gold‘s behavior over the 3 meetings in August, September, and November of 2018. The chart displays the period from ‘just before the US open the day before the FED meeting to just after the European opening bell two days post the meeting’. The price of Gold falls a total of USD 55 over the three meetings. The very interesting aspect is to observe that the trading patterns through all 3 events are similar. 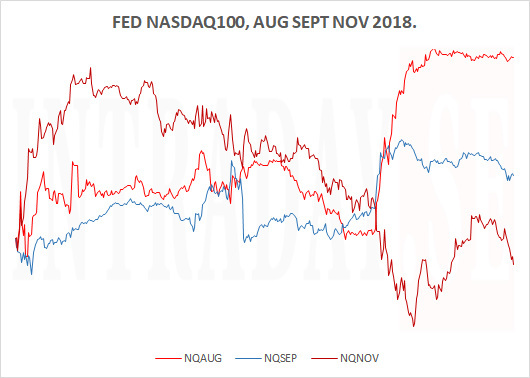 Below is how the Nasdaq100 index behavior acts over the 3 meetings in August, September, and November of 2018. The chart displays the period from ‘just before the US open the day before the FED meeting to just after the European opening bell two days post the meeting’. The Nasdaq100 gains a total of 200 points over the three meetings. In conjuction to price-movements at these type of events, it is essential for shorter term trades to be prepeared with suitable stop-losses in advance. If not great wins, a 'good' stop-loss will at least minimize losses. Here is a link to Fed news provided by FX Street.